Man: I hope things get better for you. Man: I saw those torn jeans and thought you must be in some sort of financial trouble. Woman 1: Are you nuts??! I paid a small fortune for these name brand torn jeans! Narrator: First rule of torn jeans: Do not talk about torn jeans. Man: Love that torn jeans style! Looks great on you! Woman 2: That's in very bad taste. Just because I can't afford new clothes is no reason to be sarcastic. 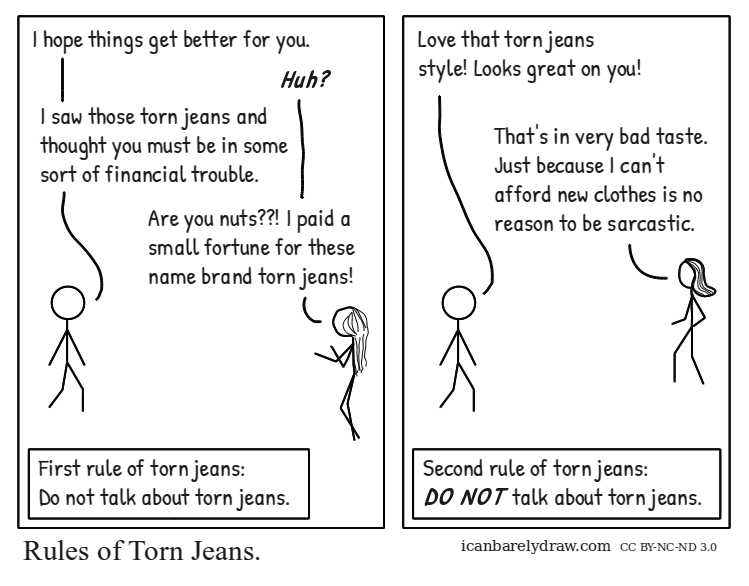 Narrator: Second rule of torn jeans: DO NOT talk about torn jeans. Title: Rules of Torn Jeans.